A large pistachio tree marks the entrance to the underground catacombs of Agia Solomoni in Kato Paphos. 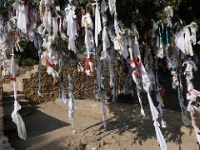 A strange sight, it's usually festooned with cloth tied onto it by the faithful as offerings in the hope the sacred tree will cure various ailments. The catacombs were carved into Fabrica Hill in the 4th century BC, below the ancient Roman wall. Underground chapels feature frescoes and graffiti left by 13th century crusaders, and there are numerous legends and stories attached to the patron saint Ayia Solomoni. There's little to no guidance or information on offer at the site so it is best to do some research before you go to understand what you are looking at.